The luxurious five-star InterContinental Resorts’ bungalow suites are ideal for honeymoons in paradise. Day 1 Los Angeles/Tahiti/Moorea Depart this afternoon on your flight bound for the most beautiful islands in the world. 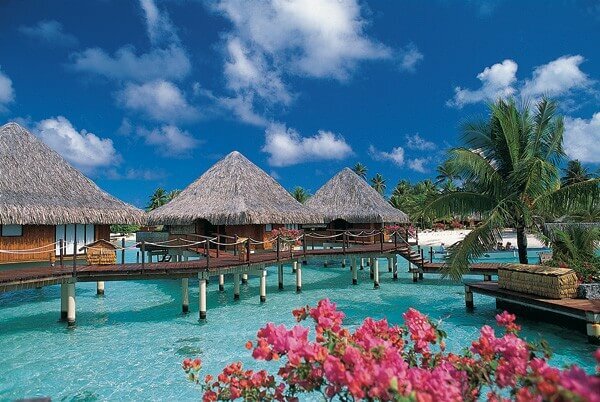 Less than eight hours later, you’re in Tahiti…the ultimate South Seas destination. Following a traditional Tahitian welcome, fly to Moorea, an island of emerald peaks, palm-shaded beaches, and spectacular lagoons. Day 2 and 3 Moorea You’ll discover the beauty of Moorea as you drive around the island and into the lush, hidden valleys. You private beach bunalow at Moorea Intercontinental is your new home. Join the snorkeling excursion to the motu where you can swim among the multi-colored fish in the crystal clear lagoon. Travel back in time to Polynesia of yesteryear when you visit Tiki Village. Celebrate the tama’ara’a feast of island foods and a spectacular Polynesian fire and dance show. Relax at the hotel’s Helene Spa and enjoy a massage spa experience. Day 4 thru 6 Bora Bora Bid farewell to Moorea this morning and fly to Bora Bora, undoubtedly the most famous island in Polynesia. No visit is complete without the shark and ray snorkel excursion where you’ll watch Tahitian divers hand feed black-tip sharks. For an exploration adventure, take the 4×4 jeep safari on Bora Bora. To top off your trip, bid farewell by indulging in your romantic champagne dinner under the stars. Consider upgrading to an exceptional overwater bungalow at Intercontinetal Bora Bora Le Moana..a great value! Day 7 Bora Bora/Tahiti/Los Angeles Board your return flight to Tahiti late today. Tonight, depart these romantic islands aboard your non-stop Air Tahiti Nui flight, arriving in Los Angeles the next morning. * Seasonal air and land supplements apply. Ask for details at time of booking. Air fares are subject to change without prior notice. Prior to sending final payment, please request an air fare update. * Prices are in USD, ‘from’ per person, based on double occupancy, unless specifically noted. Single or extra person (triple) supplements apply. Package rates are inclusive of room tax & VAT, International air-inclusive packages rates also reflect airline fuel surcharge and U.S. airline taxes and fees. Strictly subject to availability at time of booking. Black out dates, minimum stay requirements, seasonal surcharges, currency exchange fluctuations, and other restrictions may apply. Prices, itinerary and conditions are subject to change without notice. Clients may be responsible for local city taxes, bed taxes and airport departure taxes not included with the international ticket. Information will be provided at the time of booking. Pricing based on low season. Upgrade to Air Tahiti Nui Business Class, add $2950 per person. Seasonal supplements apply. Air supplements apply for Friday and Saturday travel.